EghtesadOnline: Iraqi President Barham Salih is set to travel to the United States at the head of a delegation to negotiate exemption from sanctions on Iran, as Baghdad is trying to balance its relations with Tehran and Washington. 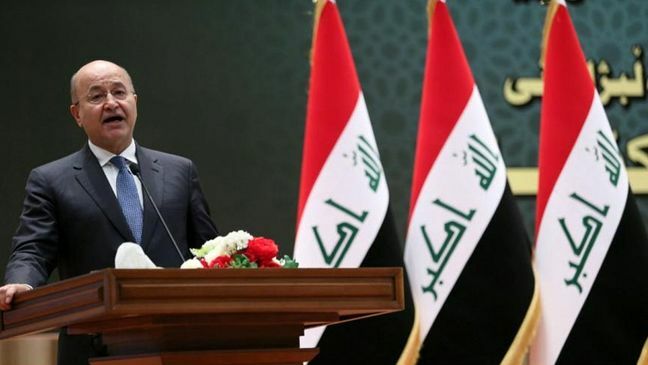 Amer al-Fayez, a member of the Iraqi Parliament’s Foreign Relations Commission, made the announcement in an interview with the Arabic-language Almaalomah news agency, ISNA reported on Sunday. He said Iraq can steadfastly refuse to comply with US sanctions on Iran, but the country would rather have relations with both Tehran and Washington at the same time. “Iraq is not able to abide by the US anti-Iran sanctions because it has long borders with Iran and cooperates closely [with Tehran] in the energy and trade sectors,” Financial Tribune quoted him as saying. The Iraqi parliamentarian stressed that Iraq is not willing to engage in regional and international conflicts and would not put its economic ties with the world at risk. The Iraqi delegation is due to set off for the US after the formation of Iraqi Premier Adel Abdul Mahdi’s Cabinet and the approval of the federal government’s budget bill. After withdrawing unilaterally from the 2015 Iran nuclear agreement last year, US President Donald Trump reinstated sanctions on Tehran in what he described as a “maximum pressure campaign” to force Iranian leaders to negotiate once more for a new deal. Iran’s trade partners and oil clients have not been immune from the hostile policies, as they have also been threatened with penalties in case of doing business with Tehran. Iraq is a major importer of a wide range of Iranian goods as well as natural gas and electricity, which it highly depends on to supply its energy requirements. As Baghdad was not able to find an alternative source of energy, the US in November offered it a 45-day waiver to continue the import of gas and electricity, and later extended it by another 90 days until a March deadline. Nevertheless, the US call for a complete energy independence remains in place. Several Iraqi figures had earlier called on Abdul Mahdi to travel to Washington and negotiate with Trump to prevent a crisis after the deadline’s expiration. An Iranian political and economic delegation headed by Foreign Minister Mohammed Javad Zarif recently paid a five-day visit to five Iraqi cities, including those in the Kurdish region, to fortify bilateral cooperation. Under the present circumstances, it is also essential for Tehran to maintain and expand relations with its Arab neighbor to counter the effects of the US strict sanctions.